Don't be horrified, but despite the gorgeous weather today we ate in the office and in under 15 minutes. Between meetings and skype calls and more meetings, it was literally all the time we could manage. And to top it off, we had gory street food, which we love, though it's not for everyone. But there is something so soul-satisfying about trashy salty lamb doused in suspicious white sauce and limp iceberg lettuce. I'm not even being sarcastic. 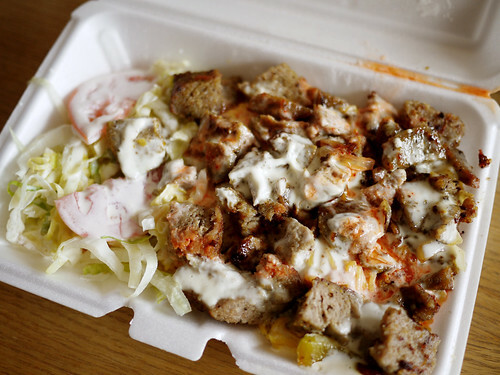 Love chicken and rice, or anything that comes out of the "halal carts." You know you're a New Yorker when you smell meat and onions grilling outside, and say, where's the food truck? I enjoy reading your posts, and seeing your gorgeous photographs!